Item number Na943 from the MOA: University of British Columbia. At centre young male figure outlined in black holding rifle in hand on right and pointing it at goose on left; hand on left holds dead goose. Lake between goose and hunter. Two profile birds above figure, one purple goose with wings down and outspread the other one is an owl (?) with black spots. 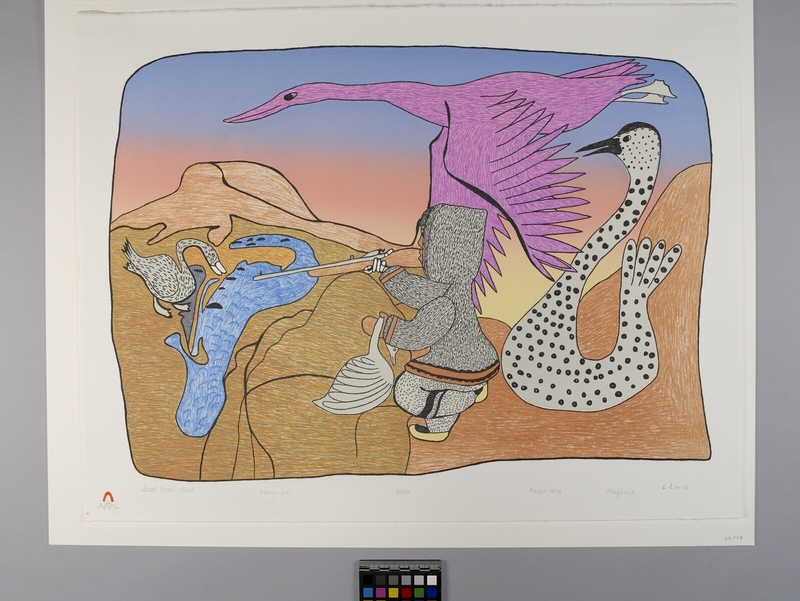 Below image from side on left: Cape Dorset stylized 'red igloo' seal above name of printmaker in Inuit syllabics, "First goose hunt lithograph 33/50 Dorset 1979 Mayoriak," name of artist in Inuit syllabics. 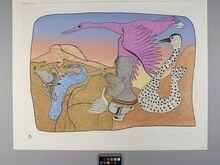 Canadian Eskimo Arts Council's blind embossed stamp in lower corner on right.